You are here: Home / Annabel's Kitchen / what to do with all these greens?! This is my weekly supply of green leafy vegetables (with a few zucchini and asparagus). 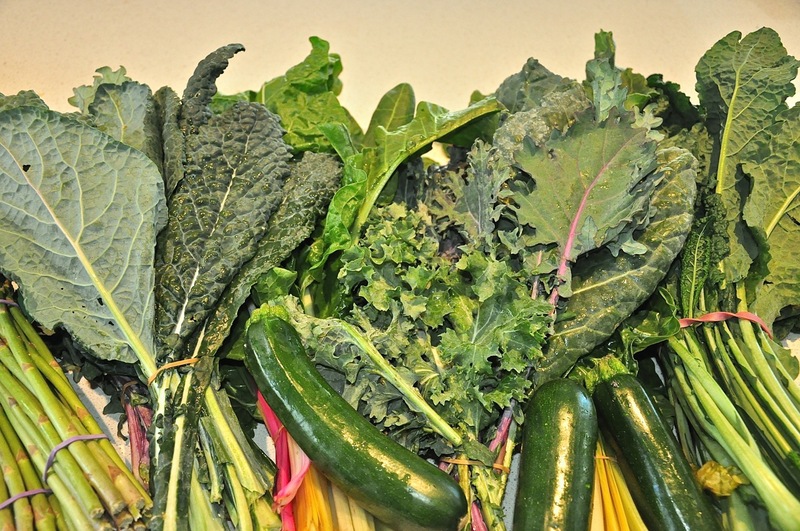 It’s mostly a mix of different types of kale (curly, Russian, Cavelo Nero – flat leaf), chard, silverbeet and sometimes greens I have no idea what they are but they look fresh and healthy when spread out at the organic farmers markets I go to. My cousin has asked what I do with all these! So this post has links to some of my recipes that include these greens, together with a few other ideas. I’d love you to post your comments below about how you use these greens. These greens are usually consumed within a week by my husband and I. My kids won’t eat them unless they are very sneakily hidden (like last night in my bolognaise). The vast majority of these are consumed in our morning Green Smoothie. I often chop them up and toss them together with English Spinach in a regular salad. Stir fried in coconut oil & coconut aminos with baby broccoli & mushrooms.